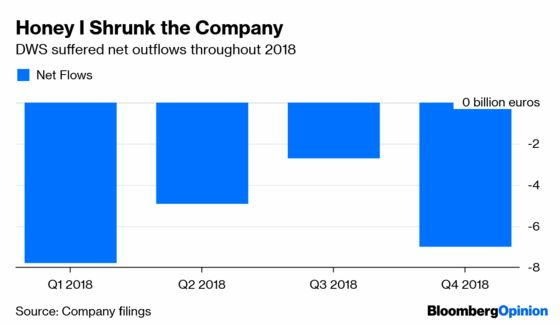 (Bloomberg Opinion) -- So it looks like the shotgun wedding between Deutsche Bank AG and Commerzbank AG is finally limping to the altar. 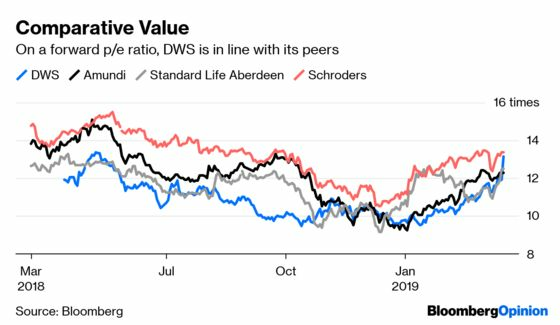 To fund its dowry of as much as 8 billion euros ($9 billion), Deutsche Bank may sell its remaining stake in DWS Group to Allianz SE, according to my colleagues at Bloomberg News. So the seller’s motivation is obvious; less clear are the reasons why the German insurer might want to get involved in the forthcoming M&A circus. In March, Deutsche Bank raised about 1.4 billion euros by selling a 22.25 percent stake in DWS, whose total market capitalization is currently about 6 billion euros. Add in a standard 30 percent takeover premium, and Allianz would be looking at finding almost 8 billion euros – less than 10 percent of its own market value – to get a deal done. So it can probably afford the purchase price. 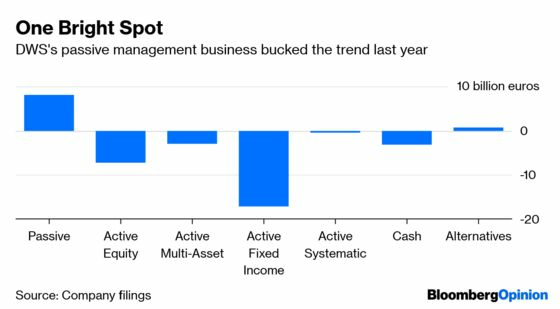 And Allianz’s Chief Financial Officer Giulio Terzariol told Bloomberg Television a year ago that his firm was is in the market for acquisitions in the asset management industry "that might add to the capabilities we have." But what would buying DWS add to Allianz’s firepower, which includes Pacific Investment Management Co.? On the one hand, DWS appears cheap compared with the price at which it was floated. Even Monday’s spike of as much as 15 percent in the stock still left DWS below its March IPO price of at 32.50 euros a share. By mid-morning it was trading at about 30.50 euros, a gain of 10 percent from Friday’s close. But on a 12-month forward blended price/earnings ratio, Monday’s move pushed DWS to a bit more than 13 times earnings from about 12 times at the end of last week, which is still bang in line with its peers. At the time of the IPO, DWS said it was targeting net inflows per year of 3 percent to 5 percent of assets under management. In a bad year for the asset management industry, DWS suffered more than its peers in 2018, with customers pulling money in every single quarter. Full-year outflows of 22 billion euros helped drag DWS’s assets down to 662 billion euros, their lowest level in at least two years. Allianz also suffered withdrawals in the fourth quarter, eroding third-party assets under management to leave it with 505 billion euros. What synergies might a tie-up achieve? Allianz’s asset management division had a cost/income ratio that rose to a smidge above 62 percent by the end of last year, quite a bit better than the 71 percent expense ratio at DWS. 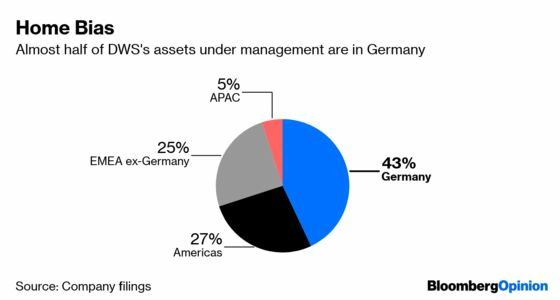 But while there could be scope for efficiencies by combining operations, shedding finance professionals in Germany at a time when the merger of Deutsche Bank and Commerzbank is itself necessitating deep job cuts might be politically tricky. DWS employed about 3,440 people at the end of last year; of the 850 staff it classed as investment professionals, more than 40 percent are based in Germany. The prospect of cutting costs by reducing the number of portfolio managers would take a leap of faith on the part of the buyer. So DWS might be a more attractive target to a U.S. firm seeking to expand in Europe. The bulk of its assets are still in its domestic market, and its geographical reach has barely budged in the past year. What it does offer to a potential purchaser is a growing passive-management business. DWS says it has more than 27 percent of the European market for exchange-traded products, and inflows of 3.9 billion euros in the fourth quarter bucked the trend for withdrawals elsewhere across its product range. The trend in fees for passive products, though, is even worse than it is for actively-managed offerings. Sure, it adds scale and diversity, and demand for tracker funds is likely to outpace that for stockpickers for the foreseeable future. But it’s a very low margin business. The idea that Allianz should buy DWS to create a national champion in the fund management arena is probably the least convincing motivation. It just about works as an argument in banking, where governments have a vested interest in ensuring that business has access to finance and loans from domestic institutions. But fund management is such an international industry already that geographic borders are increasingly porous and irrelevant. DWS does offer the opportunity for a medium-sized asset manager to vault itself into the trillion-dollar club, provided Deutsche Bank is indeed a motivated seller of its stake. But scale hasn’t so far proven to be a panacea for either Standard Life Aberdeen Plc or Janus Henderson Group Plc. The industry trends have proven far more negative than size alone can cure. So combining DWS with Allianz’s fund management division could echo on a smaller scale what everyone and their dog suspects is happening with the Deutsche Bank/Commerzbank combination – strapping two drunks together in the hope that they’ll sober each other up and find their way home.